Photo: Old Harmony Borax Works " White Gold "
Caption: Old Harmony Borax Works " White Gold "
Additional Description: Though steeped in legend, the frenzied search for gold and other materials in Death Valley produced few fortunes. Borax, the "White Gold of the Desert," ranks as the valley's most profitable mineral. Harmony Borax works, in front of you, was one of Death Valley's first borax operations. It operated from 1883-1888. 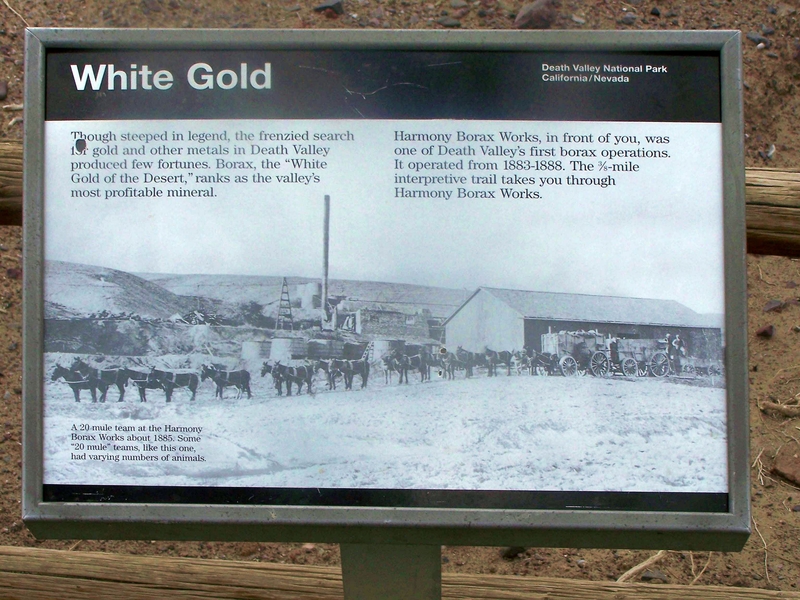 The 3/8-mile interpretive trail takes you through Harmony borax works. Picture: A 20 mule team at the Harmony Borax works about 1885. Some "20 mule" teams, like this one, had varying numbers of animals. Submitted: July 5, 2010, by Mike Stroud of Bluffton, South Carolina.